Re-reading this book reminded me of how much it influenced fantasy fiction going forward. Long before Hogwarts, Le Guin gave us the wizarding school of Roke. This was always my favorite part of the story. The novel’s protagonist, Ged, becomes a student at Roke under the tutelage of nine master wizards, all of whom may have helped inspire, at least in a faint sense, the professors of Harry Potter’s school of wizardry and witchcraft. But that is where the similarities end. Ged is a flawed hero. Fueled by a rivalry with a fellow student, Ged’s pride leads him to show off his power by practicing dark and forbidden magic. He ends up unleashing a shadow, and Ged’s quest to ultimately hunt down this demon drives the rest of the novel. In this sense, the story is deeply personal. Even though it covers years of Ged’s life, there is nothing epic about this tale. The story concerns Ged, and Ged alone. In 1968, this story would have seemed vastly different than Tolkien’s “The Lord of the Rings” or the sword and sorcery tales of Poul Anderson and Michael Moorcock. For one, there is nothing European about Earthsea. Rather, the people of its archipelago appear more like one might imagine hailing off the coasts of Africa, India, or Asia. 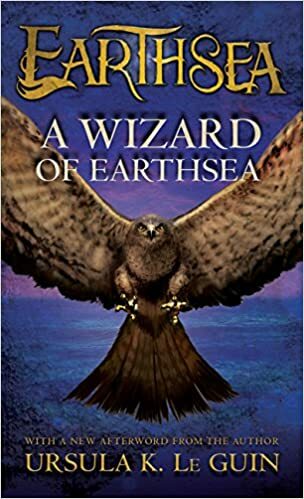 Also, there’s nary a sword to be found in “A Wizard of Earthsea.” Instead, it’s all about wizards, and wizards carry staves. A story about wizards is naturally all about magic, and Le Guin creates one of the most interesting magic systems ever made, all based on the true name of things. A wizard who knows a thing’s true name has power over it, and Le Guin harkens back to that theme throughout her tale. Reading it, I can’t help but think it inspired modern fantasy like “The Name of the Wind,” which employs a similar magic system. Despite a few bouts of lengthy exposition, and conflict that waxes and wanes maybe more than it should, I was drawn into a story as if I was reading it for the first time. I wish it had not taken news of Le Guin’s passing remind me of these tales, but I’m fortunate it did. “A Wizard of Earthsea” is a true classic, unique in its day and far ahead of its time. For anyone, particularly those who want to explore one of the roots from which modern fantasy was born, I highly recommend it. When I decided to read only books written by female authors in 2017, there was only one name that I knew HAD to be on the list: Ursula K. Le Guin. I had never read any of her work, having only recently been introduced to her via a YouTube video in which she spoke about the lack of people of color in works of fantasy. I had never stopped to ponder this issue before, so her conversation inflicted a little self-reflection in me as well as piqued my interest in her work. The book follows the young boy, Ged, also known as Sparrowhawk. Ged has all the qualities you’d wish in a fantasy lead: he is powerful and brave and good. But he’s also young, at times immature, brash, arrogant, and reckless. This recklessness inadvertently causes Ged to unleash an evil upon the world, and in true fantasy fashion, he has to be the one to vanquish the evil and make things right again. There’s not a ton of action in the book. The wizarding school is not as elaborately imagined as that in Harry Potter (though it predates that series by decades), but is interesting nonetheless. What the book does have is strong character growth, and a philosophical edge not usually present in fantasy. It will make you think as well as feel. I could not fault the writing, but as the book approached its 50th anniversary, it does feel mildly dated. Still, if you want a fantasy that is more introspective than action packed, this is a good choice, and an interesting opening to the series. I will be picking up the second novel to see how it unfolds.